Today's Draw: Hermit in the You position from the Wild Unknown and the Deck of 1000 Spreads. Do you believe that, no matter how many others may be in our lives, we're all ultimately alone? What does the thought of "being alone" make you feel? How much do you trust your inner understanding of truth over that of society's understanding of truth? Wow. Way to be subtle tarot! Even the most novice of novices can read THIS message loud and clear...haha. There's more to The Hermit than just being a recluse, though. The Hermit is a recluse for a reason. He withdraws from society to seek inner wisdom and spiritual truth. The fewer stimuli and interruptions, the more he's able to see. And while he pokes around with his lamp in the dark corners of life, he's able to see things he might otherwise see. The Hermit is usually on the move when we see him in other tarot cards, but this guy is in total stealth mode. He's ready to see the things only owls and trees see as they silently observe the world below. And this guy has a ground level view. 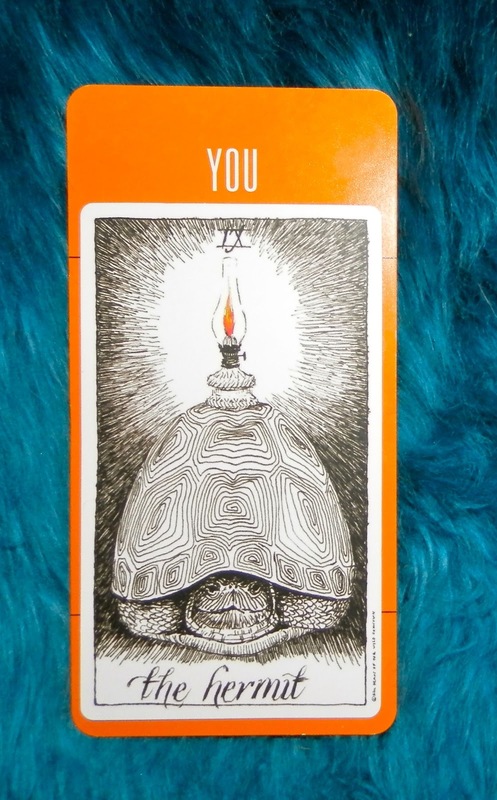 In a way, the Hermit card speaks of many things required on our spiritual journeys. For example, he shines his light on the wisdom within. This is synchronistically illustrated by the way the lamp is pointing right at the word "you" in the picture. But it's also illustrated by how the turtle is pulled inside with eyes wide open. Going within to seek knowledge and the truth of ourselves is a very scary thing. But it's also powerful to recognize that each of us holds divine wisdom and knowledge. We don't need the affirmation of those outside of us. Being comfortable and confident enough within our own shell to know and see the truth of ourselves and others rewards us with the ability to trust our own instincts, abilities, intuition, knowledge and strength. Once we become firmly footed in those things, nobody can take them away from us. This is key, because think of how many times you've deferred to others on those grounds, only to have your own instincts proven right. Another thing the Hermit speaks of detachment. This is not only in the way he detaches from the cacophony of the world to hear the silence within, but it's also in the way he detaches from what he's been told in order to reference his own wisdom. This is what the whole spiritual journey is about, imo. Religion is what you're taught about God and spirituality is what you learn about God through your own inner seeking. While others can offer techniques and support along your spiritual journey, it simply must be traveled alone. Again, this takes courage and trust in your own inner knowing. But it's a personal relationship that, even though you may be able share the fruits of with like minds, you nonetheless have to detach from outside influences in order to find authentically. A third thing the Hermit speaks of is intertwined with the detachment thing. It's the idea of seeing things with new eyes and a new mind. We have to detach from what we've been told and what everyone else sees as being real in order to have our eyes open enough to see what is truly real. Every experience and interaction in our lives colors the "truth" or "what is". And while the pursuit of truth is a lifelong and ever-shifting journey, if we stand any chance of seeing it, it's has to be through virgin eyes that have detached from all preconception. This is why the Hermit searches in the night and why this particular one sits silently within his shell appearing as a rock or stone to all stimulus around him. He needs the silence and stillness, as well as the ability to shine a light on things normally unseen, to find the truth of his world. If there were one message to walk away from all of this with, it's the simplest and most basic one of spiritual pursuit—you are the light, the seer and the knower. There is no mystery or question that can't be resolved from within. You don't need to become illuminated or enlightened. You've got that already. You just need to raise your lamp and steer your way there.